I had to put my Zora down on March 15th….her back legs had been injured too many times (she was just barely 11), she was susceptible to sprains, blew out a heel and then the good leg faltered. I got her a year before you got Charlie. I am still not over it, will never be over it. I cry every single day. But, I did adopt an 11 year old cattle dog who had been abandoned….his name is Charlie. Go figure. PJ ~ (((((((HUGS))))))))) I am so sorry……. Hi Shreve – your book The Daily Coyote was propped up on a shelf at my local thrift store this past Saturday. 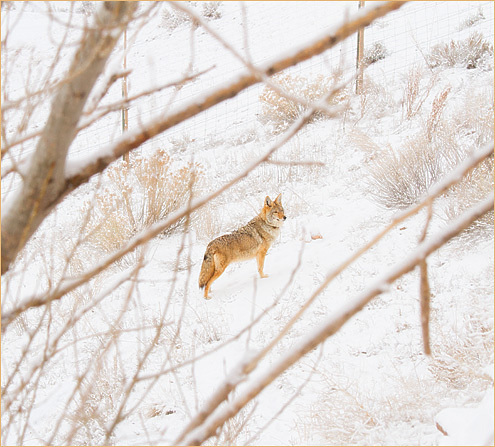 I have lived in rural Montana since ’87 and have always had a love of coyotes. So, the pic on the book immediately grabbed me and I grabbed it! Read through it that day and thoroughly enjoyed it. It has been bugging me since wondering if Charlie was still around and looked you up to see this new book announcement. Talk about timing!! I went to mail the book to my sister and niece in Seattle and two co-workers waylaid it wanting to read it. Looking forward to this new book! DR ~ that’s awesome! yay :) Thanks for the love, and for sharing our story! I love the way the angles match. Charlie and the trees. Great capture! We are wondering about Chloe as we haven’t seen pictures of her.